Without being able to see the food, parents rely on blind optimism and package labels to tell them what their kids are eating. I wish I could tell you these popular pouches are what they’re claiming to be, but it’s time to pull the wool off your eyes. Here’s the truth — baby food labels have been lying to you. Like many things, when it comes to baby food, it’s what’s on the inside that counts. Manufacturers make it impossible to tell what the ingredients are, or if mold, rubber, spoiled food, or “foreign matter” are even inside. 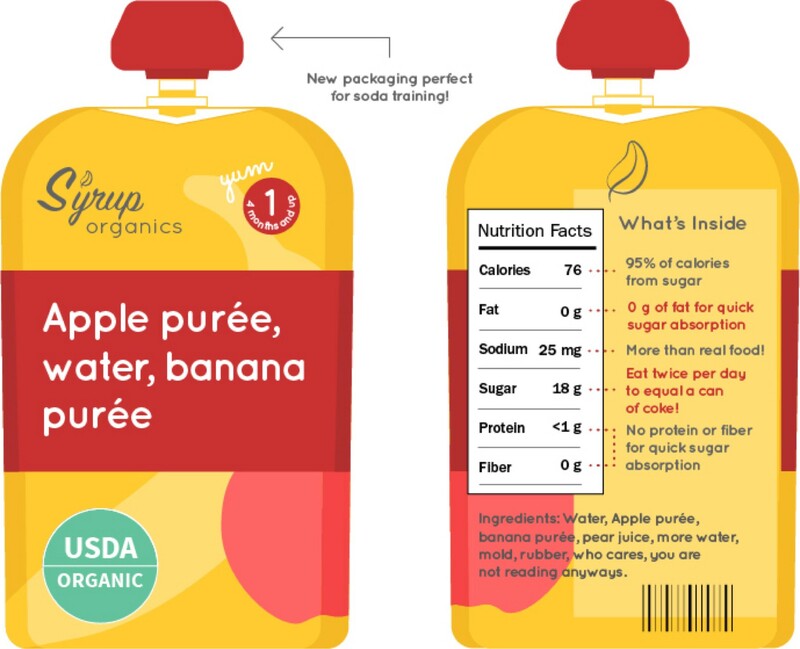 Last year, the CSPI threatened Plum Organics with a lawsuit for using a bait-and-switch tactic on their front of packaging with untrue ingredient claims. In the Kale, Apple & Greek Yogurt blend, the first three ingredients were apple puree (sugar syrup), water, and pasteurized yogurt (dead bacteria). In the Green Bean, Pear & Greek Yogurt pouch, the first ingredients were water, apple puree and banana puree. And while it may seem like apple and apple puree are the same, they couldn’t be more different. Purée exporters boil down fruits and vegetables to make a shelf-stable pulp that is easily shipped all over the world. To make baby food, manufacturers source these pre-made purees, combine them in a factory, then boil the purees down a second time. After two rounds of ultra high heat processing, the resulting syrup is high in sugar and low in nutrients and no longer resembles the original food. It’s not surprising then, that commercial baby food lacks the nutrition found in real food. In a recent New York Times piece, a research team investigated 108 brands of infant porridge from around the world and found less than a quarter met international standards for fat, protein, and zinc. This team is now calling for more stringent guidelines and certification for foods in the baby aisle. Similarly, a recent UK study showed that commercial baby food contained only one-fifth of the requirements for calcium, magnesium, iron and other micronutrients compared to its original state. To reconstitute concentrate into a thinner, more slurpable puree, manufacturers dilute it with water. Because many commercial varieties are low in nutrition but high in sugar and calories, store-bought baby food is half as nutritious as homemade baby food. What makes this even more frustrating is that while store-bought products already exceed sugar recommendations, studies have shown the labels underreport sugar content by as much as 87%. A baby’s first food experiences create an imprint for their adult palates. And when you’re an adult, “sugary food in bright packages eaten through a straw” comes in the form of soda, junk food, and mindless eating. Kids who eat commercial baby food develop palates for processed food, so it’s not surprising to see these same kids eat less fruits and vegetables later on in life, and develop a higher risk for diabetes and obesity. Over time, eating a nutrient-poor, high-sugar diet can take a physiological toll on a baby. Research also shows that homemade baby food is associated with higher IQ and commercial baby food is associated with lower IQ at 6, 15 and 24 months. This effect can be seen all the way up to 8 years of age. Years ago, I researched at a lab that focused on brain health in adolescent obesity. The investigators at our lab discovered kids who suffered from adolescent obesity and diabetes had smaller brains and lower cognitive test scores than healthy kids. Clearly there’s an inverse relationship between sugar and brain health. There’s nothing better than a spoonful of real food, with its textures, colors and actual spoon, to teach your baby how to eat, well, real food. It’s all in the details. The full sensory experience of seeing, smelling, touching, chewing and swallowing food full develops your baby’s motor skills and a palate for whole foods that will last well into adulthood. From this he or she learns to read satiety cues, turning away from the spoon when full. On the most basic level, babies need adequate nutrition for their physical and cognitive development. Swapping out the pouch for the spoon can boost IQ, prevent childhood obesity and diabetes, and create a healthier palate for fruits and vegetables later in life. You can either opt to make baby food from scratch or use a service like Raised Real to prep and portion all the ingredients for you. Either way, know that you’re giving your kids the gift of a healthier future with every bite. I’m on a mission to empower parents to feel good about feeding their kids. Have thoughts on this? Reach me at michelle@raisedreal.com. P.S. Shout out to our awesome advisor mollie chen for gently nudging me to write this piece. I make a lot of bad jokes and use nutrition facts as ice breakers. Dietitian and PhD in Nutrition. Founder at raisedreal.com.